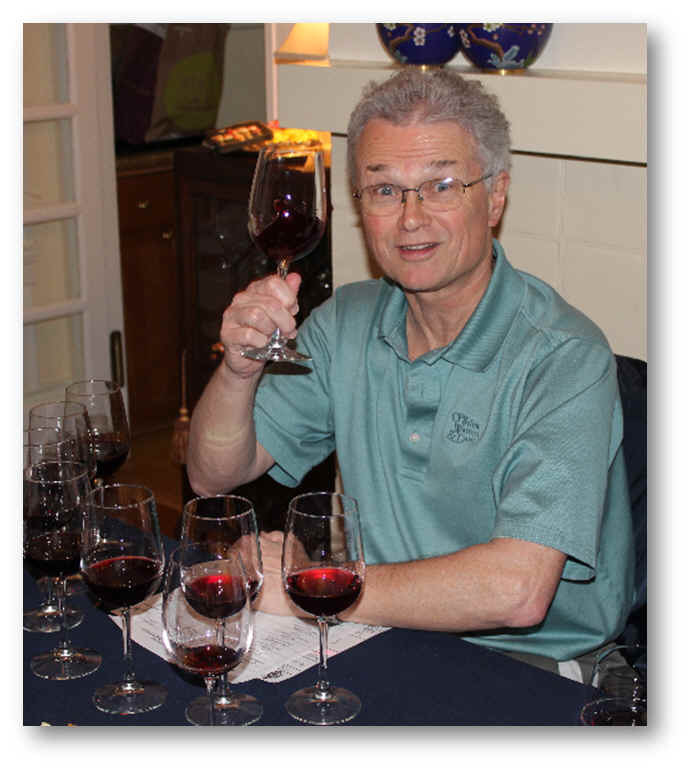 Host Doug Moke was interested to take a look at Pinot Noir wines, so we assembled a set featuring a wine we view as a benchmark, Etude, along with some new brands and some old favorites. 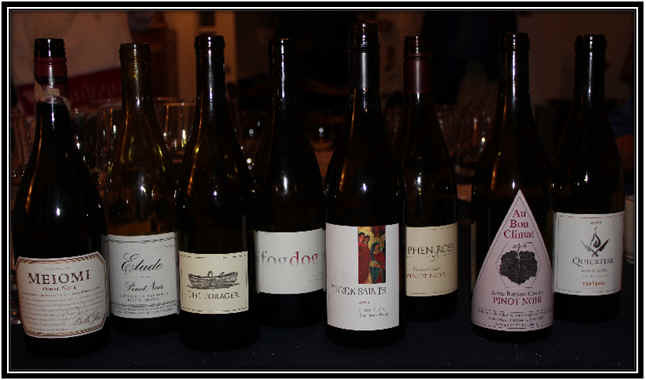 Most of the wines, apart from the Etude, were in the $20-$30 range. Two wines distanced themselves from the pack, with a third not terribly far behind. Four bottlings were well off the pace, though none were terribly flawed from a technical standpoint. 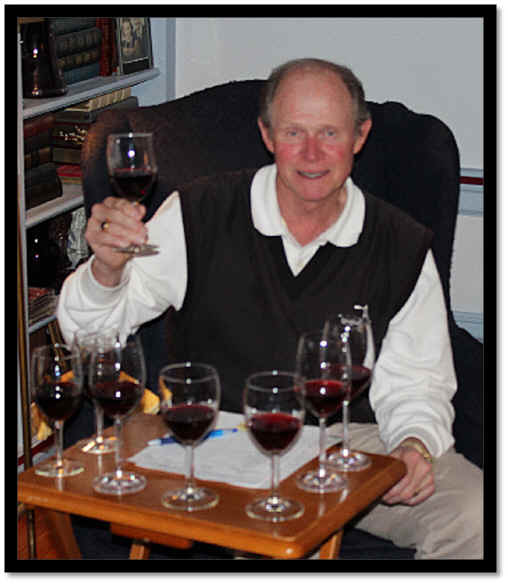 The wines are current releases, half from 2009 and half from 2008. Here's a wine aimed at fans of the Bravo channel on cable TV show "Top Chef." 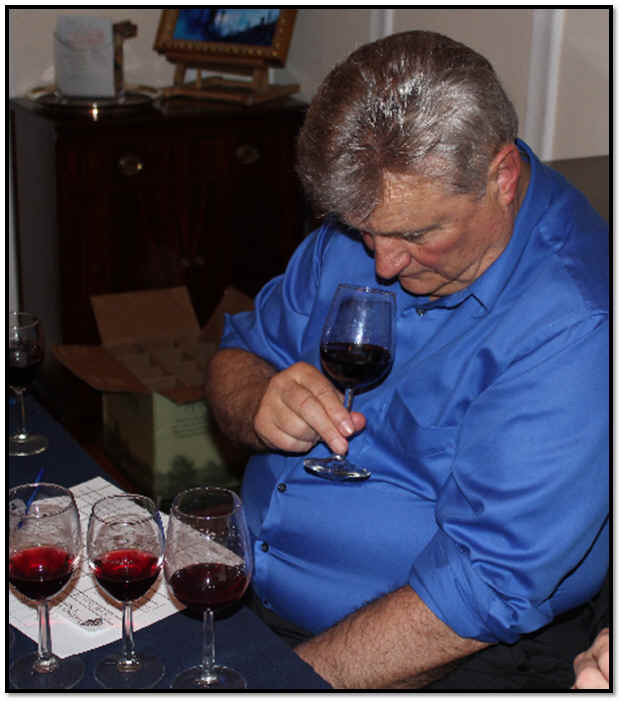 Unfortunately, the wine received a "pack your barrels and go" directive from the Vino Fino tasters with its last place finish. The wine is made by the Terlato group (Rutherford Hill, Chimney Rock, Sanford, etc.). It's light garnet in color and shows some Beaujolais-like fruity aromas with a faintly woodsy note. Strawberry in character. Light tannins. Best in its youth. Standard. I'd give it a one-half star rating on my three star scale, no stars being an ordinary bottle of wine. Light garnet in color, this shows a lightly berryish fruit aroma with a faintly leathery fragrance underneath...perhaps it will veer off into showing a significant Brettanomyces character with bottle aging? It's dry and reasonably acidic. On the palate this is a light, tight little Pinot Noir...superficial at best with a touch of tannin. Limited prospects here. No stars. Light garnet in color, the aromas present a mildly woodsy, lightly oaky fragrance. It's definitely Pinot Noir, based on the nose. Dry, medium bodied and showing lightly cherryish fruit on the palate...simple, easy, light Pinot Noir. I gave it a one star rating...no aging potential, but perfectly pleasant, serviceable Pinot. Medium garnet in color and it was downhill from there...The aromas reminded me of stewed rhubarb. 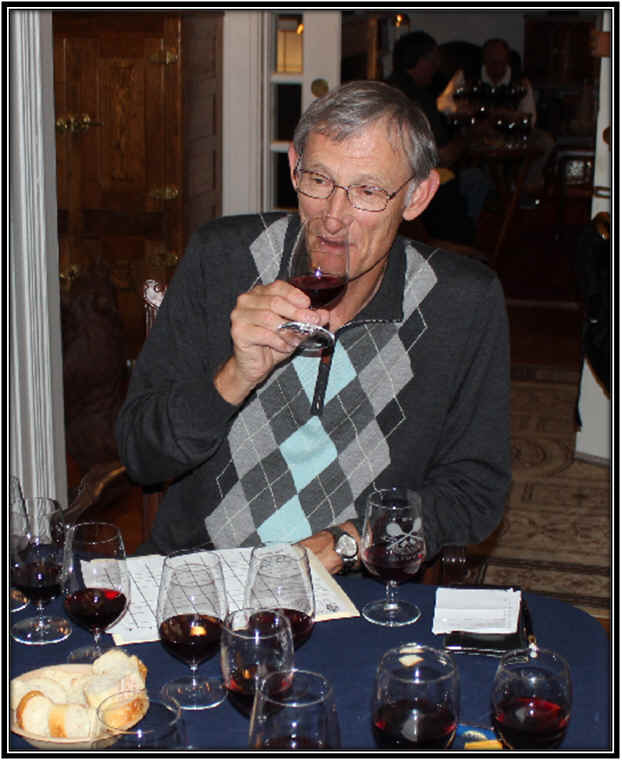 On the palate, the wine seemed slightly sweet and showing a sour streak. The stewed rhubarb character came through on the palate, with a slightly sweet impression and faint tannins. The wine seemed like a mess to me. No stars. Clear in appearance and with medium garnet color, this is a second label from Joseph Phelps' "Freestone" project. The aromas offer light cherry fruit and mild oak with a woodsy undertone. It doesn't seem bone dry, though the acidity is in check. Medium bodied. Fruity flavors with a sweet, cherry cola-sort of character. Nothing special. I gave it a one-half star rating. Medium garnet color, this wine offered a lot of sweet wood, dark cherry fruit and "Pinot Noir." 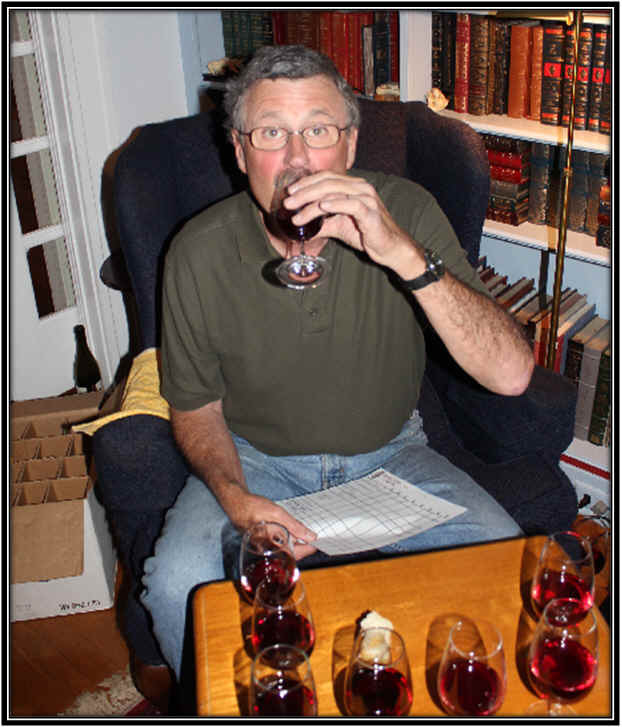 The wine is dry and moderately acidic, being medium-full in body, but still within the realm of Pinot Noir. It's lightly tannic and showing all sorts of dark cherry flavors with nice oak. I felt this was one of the few wines in the line-up which could evolve a bit more with bottle aging. One-and-a-half stars+, maybe two. Fine. Clear in appearance and showing medium+ garnet color, this wine has ripe berry fruit and a brown spice overtone on the nose. Hints of cloves and wood spice are in the forefront. It's dry and nicely acidic, with medium body. The brown spice flavors give way to ripe berries and some chocolate/cherry sorts of flavors. This is young and should be fine for a few years. One-and-a-half stars. Meiomi is part of the Wagner family stable of wines, Belle Glos being their "heavy hitter" label for Pinots (Caymus for Cabernet).